That question came from the contractor. A nondenominational church in Franklin, Tenn., known as The Gate, wanted a space that suited their music-centered, heartfelt worship services, as well as room to gather, fellowship, and relax. Collaborative Studio had never done a church before, but in 2009, with no end in sight to the sagging economy, the answer was yes. We paid a visit to the pastor, Steve Fry, and had our first look at the space. We found a former bridal store at grade, with a wedding chapel below, 9-foot ceilings throughout. Not promising. Fry said they needed someone to help them choose carpet, paint, and tile. We asked him questions about how he was intending to use the space, and what he described was not a traditional church service. He wanted to foster social interaction. He envisioned places for laughter and conversation. And a main assembly area where heartfelt worship and song would take center stage. These ideas sounded familiar to us. “We had experience creating vibrant gathering spaces. Our corporate clients typically want spaces where employees enjoy gathering and talking, such as the HCA Cafe,” says Jenny Campbell, founder and lead architect at Collaborative Studio. We showed the staff at the Gate photos of the HCA Cafe and other corporate spaces. They resonated. We dug deeper, and soon the project had evolved from a paint job to a full-fledged interior architecture project. Now the problem was how to create the kind of place they wanted in a low-slung, hollowed-out retail store. Just as we would do with a corporate floor plan, we divided the space up into areas and began to experiment with the space available. Curved forms divided common areas from the worship center. In the worship center, the stage was placed along a wall, shattering expectations about how this rectangular space should be utilized. The result was a semicircle seating arrangement that focused the attention of the worshippers on the program as well as on each other. Out of an old bridal store, several hundred worshippers would find a sanctuary. The ceiling was another challenge. The bottom of the roof joists were right at 9 feet, so there was no leeway there. 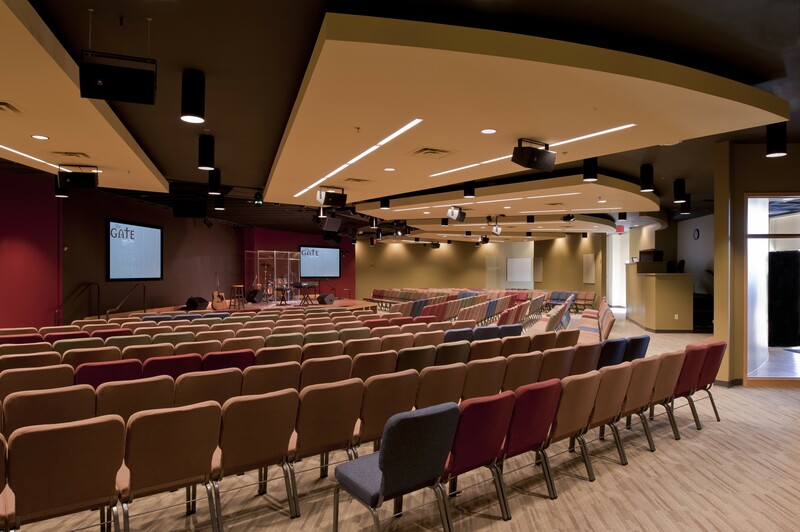 The solution in the worship center was to actually lower the ceiling by hanging acoustic baffles, or “clouds,” and paint the ceiling black, thereby tricking the eye into thinking the ceiling rose high. The illusion worked. “Divine intervention,” is how Jenny describes the solution. By listening well, and by refusing to be limited by a challenging space, Collaborative Studio achieved something way beyond the client’s expectations.